FA: Jack Miller and friends, July 1971. A fun crack leads to a short section of slab to the first anchor. 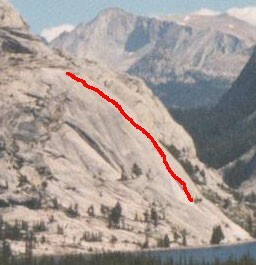 The second pitch has a huge runout on nontrivial terrain (above an old ¼” bolt), following a faint seam through pure gold polish. It’s easy, and fun, to head left at the roof and finish on the cruiser flake of White Flake. This route was originally rated 5.7, but on the second pitch it likely climbed over to the right near (or on) the third pitch of West Country. The last pitch has one old bolt lost in a sea of featured slab. Which SuperTopo guidebooks include a topo for The Shadow Nose?